The Eban Aya House was created by a Senegalese organization, Atelier Koe, as a design/construction strategy rather than a static structure. By developing quickly renewable building materials - such as cultivating a bamboo garden that rapidly regenerates strong resilient stalks - the design process becomes a continuous mechanism that empowers citizens to build their homes and communities in phases based on the owner’s capabilities. The primary shell is composed of a compressed earth construction that provides natural thermal and acoustic insulation, and leaves almost no carbon footprint throughout its production. Bamboo forms permeable clerestory walls that can be left open or filled with tapestries for shade and ventilation control; thicker stalks are embedded into the outer earthen walls to form floor joists at any footprint desired by the inhabitant. A light-weight thatched roof supported with bamboo beams extends beyond the outer walls of the building for effective shading to the interior. 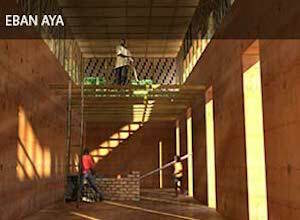 The Eban Aya House was created as an entry to a mud house building competition in 2014, where it received second place.